The 2nd century Ptolemy’s Geographia, based on the work by Marinus of Tyre a century earlier, contains a region named Aurea Chersonesus, meaning the Golden Peninsula in Latin (Χρυσῆ Χερσόνησος, Chrysḗ Chersónēsos in Ancient Greek). The Aurea Chersonesus is also shown on the mappa mundi of Andreas Walsperger, made in Constance around 1448. It is not known if Ptolemy had any maps in his original Geographia. In any case, Renaissance scholars managed to reconstitute a series of maps from the tables of locations compiled in Geographia. The earliest surviving maps of these works came from the end of the 13th century. The first printed edition of Geographia with the reconstituted maps was published in Rome in 1477, thereby becoming the first ever printed atlas of the world. Ptolemy, like many early geographers, believed the Indian Ocean to be a closed sea and maps based on Ptolemy’s work show Aurea Chersonesus to be located within a closed basin, though by the 8th century, Arab geographers were aware that the idea of the Indian Ocean as a close basin was mistaken. The series of maps contain twelve maps on Asia, in which the eleventh map (hence the name Undecima Asiae Tabula) depicts India Extra Gangem (India beyond the Ganges River) and Sinae (China). There is a region on the map labeled Aurea Chersonesus. 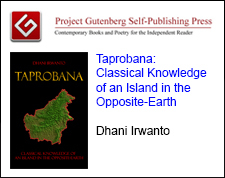 As the name implies, the Renaissance mapmakers drew the region as a promontory protruding from the land labeled India Extra Gangem, and Barussae – a renowned port town of Barus in the western coast of Sumatera – is plotted as a group of small islands even though Ptolemy writes it as a cannibalist common place (quinw). Aurea Chersonesus is then typically acknowledged to be the Malay Peninsula. 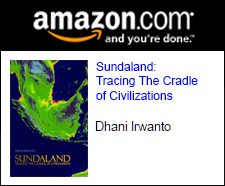 However, the author argues that Aurea Chersonesus is a place in western Sumatera called Tanjungemas renowned for its gold mines in the ancient time, as discussed below. The names and coordinates of various geographical features and settlements of the Aurea Chersonesus are given in Ptolemy’s Geographia, including towns and rivers. Ptolemy’s views concerning the geography of southeastern Asia was derived mainly from the works of his predecessor Marinus of Tyre, who had quoted the knowledge from the sailor Alexander who had visited Aurea Chersonesus. Of course, we can not expect a good accuracy of the coordinates because of the method of their measurements and most of them are derived from the information without knowing the exact locations. The latitudes of the places around the Aurea Chersonesus are only a few degrees from the equator, either south or north, or considering the method for measuring the latitudes in the time, it can be generally said that the region is in the proximity of the equator. Ptolemy could have been confused with the north or south latitudes of the places since he knew only the maximum hours of the day. There is a region in Sumatera named Tanjungemas, literally means the Golden Peninsula, now the name of a district in Tanahdatar Regency in the West Sumatera Province of Indonesia. The region is in the latitudes of between 0º 24” and 0º 33” south of the equator, so that it is in the proximity of the equator. The region is renowned for its gold mining in the ancient time and supposedly located in the land of origin of the Malays. Its location is in the upper Batanghari and Inderagiri Rivers where the miners allegedly use them to transport the product to the eastern coast of Sumatera. The region was in the proximity of the capital city of Malayapura Kingdom (Letter Kingdom of Malay, also known as Pagaruyung Kingdom) founded by Adityawarman and presided over the central Sumatera region between 1347 and 1375, most likely to control the local gold trade. A Portuguese Tomé Pires in Suma Oriental mentions a gold-rich area referring to this region in some time between 1513 and 1515. The first European to enter the region was Thomas Dias, a Portuguese employed by the Dutch governor of Malaka, who travelled from the east coast to reach the region in 1684. The primary local occupations at the time were gold panning and agriculture, he reported. The British Governor-General of Bencoolen Sir Thomas Stamford Raffles visited Pagaruyung in 1818, reaching it from the west coast. Assuming that Tanjungemas is supposedly the Golden Chersonesus, the author identifies various geographical features and their coordinates mentioned in the Geographia written by Ptolemy. 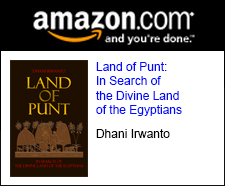 Marinus apparently obtained the information from three separate notes of the regions, those are the mining, the eastern coast, and the piracy prone regions, that made Ptolemy to plot them in different scale because of the inaccuracy of the data, and to give exaggeration on the mining region. Hence, three separate identifications are made, as follow. The region of Aurea Chersonesus contains places names, a trading place (emporium), rivers (fluvius) and promontories (promont). The plot of their coordinates given by Ptolemy are shown on Figure 2. Batusangkar is the capital of the Tanah Datar Regency in West Sumatera Province, known as “the city of culture”. The town is near the former seat of the Minangkabau royalty established by Adityawarman, the king of Malayapura (Letter Kingdom of Malay) in Pagaruyung in the 13th century, represented by the reconstructed Pagaruyung Palace. The town has the richest stone inscriptions in Sumatera left by Adityavarman. There was a Dutch outpost in the town established during the Padri War (1821 – 1837) known as Fort van der Capellen, built between 1822 and 1826. Singkarak is a district in the Solok Regency of West Sumatera Province, located on the shore of Lake Singakarak. Tikalak is a village near the main settlement of Singkarak District, also on the shore of Lake Singkarak. Ptolemy mentions that the maximum hours of the day at Tacola is 12¼ or about 0º 50’ in latitude. Singkarak and Tikalak have latitudes of about 0º 40’ south of equator. Solok, or previously known as Nagari Solok, is a town in the Solok Regency of West Sumatera Province. The names of Batang Lunto and Sawahlunto apparently came from the root name Lunto, a place in the bank of the junction of Ombilin River and Batang Lunto River. Batang Lunto (batang means “river”) is a tributary of Ombilin River where supposedly irrigate the surrounding rice fields, hence named Sawahlunto (sawah means “rice field”). Sawahlunto is one of the mining towns in West Sumatera. It was first established as a town in 1882 by the Dutch along with coal mining operations. Coal was discovered in the mid-19th century by a Dutch geologist De Greve. Sawahlunto was a regency and is now a town in the West Sumatera Province. Chryse in Greek means “gold” and soana is allegedly from sungai, means “river”, hence Chrysoana means the Golden River. 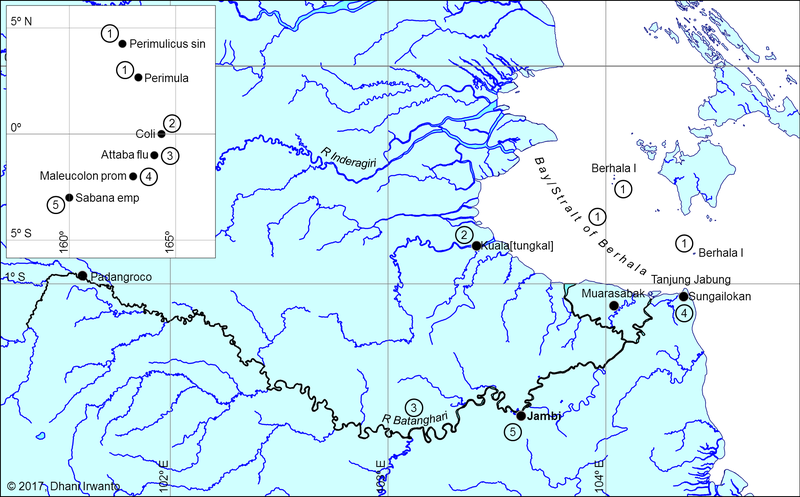 The western side of Tanjungemas is bordered by Selo River, and a segment of Ombilin River between its junctions with the Batang Lunto and Selo River. These rivers were apparently named Sungai Emas, meaning “Golden River”, as the name is bore by a village named Sungaimas (also meaning “Golden River”) located on the bank of the Selo River near the town of Batusangkar. Muara or later known as Muara Sijunjung is a capital town of Sijunjung Regency, West Sumatera Province, located on the bank of Kuantan River where it branches out into three rivers in the town. 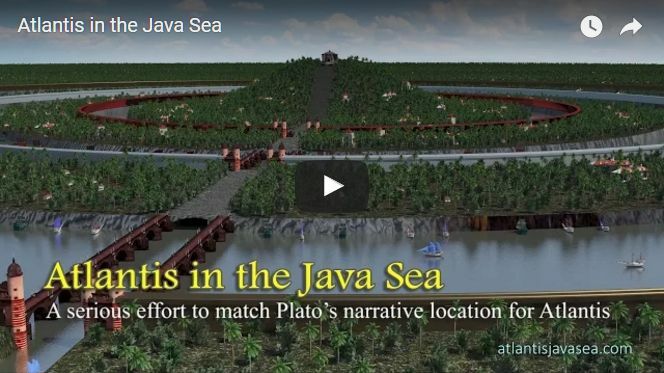 It was allegedly the entry point to navigate to Tanjungemas after the land route from the last navigation point in the upper Batanghari River at Padangroco, mentioned by Ptolemy as Attibam fluvius (river). 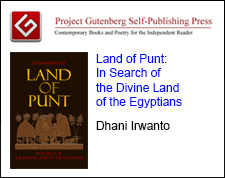 Ptolemy writes that there was a separate river apart from the Chrysoanu fluvius (Selo and upper Ombilin Rivers) and the Palandas fluvius (Batang Lunto River) around the region of Aurea Chersonesus (Tanjungemas) named Attibam fluvius, geographically located south of Tharra (Muara Sijunjung). This river is apparently the upper Batanghari River (see Attaba fluvius hereafter) at around Padangroco. 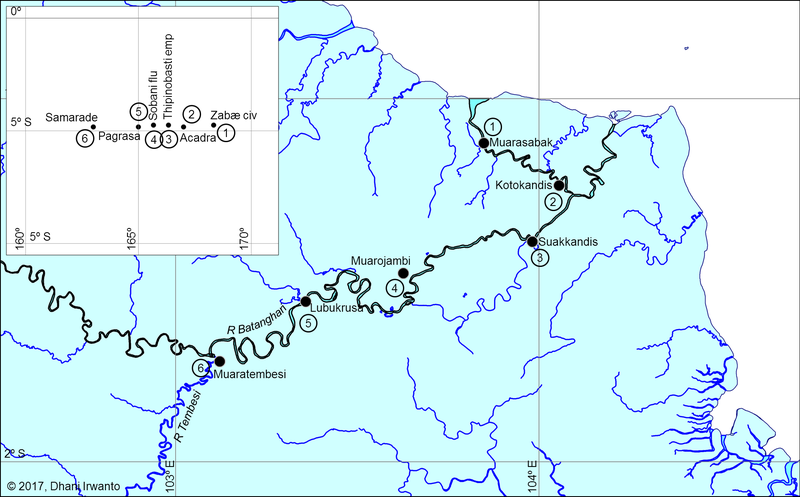 Furthermore, he writes that it was a part of a large river flowing southeastward (the Batanghari River) which emptied at Sarabes (Muarasabak, see Zabaæ and Attaba fluvius hereafter). Archaeological records show that people accessed Tanjungemas through Batanghari river as it was more navigable than the adjacent Inderagiri River. The uppermost point of the navigation was at Padangroco, allegedly a resting place – where later on Adityawarman built some temples in this area – before continuing through a land route to Muara Sijunjung. The estuary of the Batanghari River on the eastern coast of Sumatera, known as Muarasabak, then developed into a busy trading port, the center of the 7th century Malayu Kingdom (Earlier Kingdom of Malay) and the center of the Buddhist education, as evidenced by archaeological records, inscriptions and chronicles of the Indians, Chinese and Arabs. Ptolemy mentions two promontories around the Aurea Cheersonesus region. They apparently the place names prefixed with “tanjung” (means “promontory”) along the eastern coast of Lake Singkarak, such as Tanjungbatutebal, Tanjungbuluh, Tanjungaur, Tanjungtabing and Tanjungmuara. 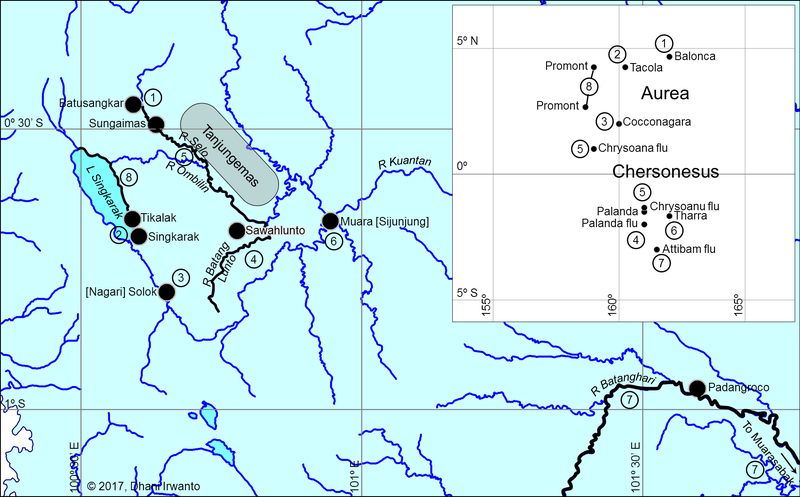 Figure 2 – Places in the region of Tanjungemas. Inset is the plot of places given by Ptolemy with his coordinate system. Numbers are related to the explanations in the text. The region of the eastern coast consists of place names, a river (fluvius), a bay (sinus), a social body (civitas) and a trading place (emporium). The plot of their coordinates given by Ptolemy are shown on Figure 3. Berhala is now the names of a strait and a bay, and two small islands off the eastern coast of Sumatera near the city of Jambi. There are several places named with a prefix Kuala (means “estuary”) on the coast of Berhala Bay. 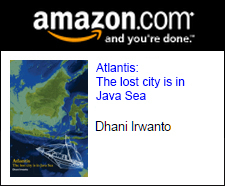 The most prominent one is Kualatungkal, which is an ancient town mostly occupied by the Banjar people from Kalimantan. There is a delta at the estuary of Batanghari River named Muarasabak, meaning the estuary of Sabak. It implies that the Batanghari River was previously called Batang Sabak (batang means “river”). See also Zabæ hereafter. Tanjung Jabung (tanjung means “promontory”) is a promontory at the eastern coat of Sumatera which ends the Berhala Bay (Perimulicus sinus) on the south. There is a village there named Sungailokan. Jambi is the capital city of Jambi Province located on the eastern coast of central Sumatera on the bank of Batanghari River. It was the site of the Srivijaya Empire that engaged in trade throughout the Strait of Malaka and beyond. Jambi succeeded Palembang, its southern economic and military rival, as the capital of the kingdom. The movement of the capital to Jambi was partly induced by the 1025 raid by pirates from the Chola region of southern India, which destroyed much of Palembang. The Jambi provincial administration is striving to have the ancient Muarojambi temple site at Muarojambi village not so far from the city of Jambi, recognized as a world heritage site. The site was a Buddhist education center that flourished during the 7th and 8th centuries and the temples are made from bricks similar to those used in Buddhist temples in India. The Nalanda inscription (860 CE) talks about king Devapaladeva of Bengala (Pala Empire) who had granted the request of Sri Maharaja of Suvarnadvipa (Sumatera), Balaputra, to build a Buddhist monastery at Nalanda (present day Bihar state of Northeastern India). Jambi is mentioned in Chinese chronicles in the era of Sung Dynasty as Chan-pi (Slamet Muljana, 2006). The history of the Sung Dynasty describes that the king of San-fo-tsi (Suvarnabhumi , “the Land of Gold”) resided in Chan-pi. The messenger from Chan-pi came for the first time at the Emperor’s palace in 853 CE. The second messenger came also in 871 CE. This information incarnates that Chan-pi has appeared confined to China in those years. A Chinese chronicle by Ling Pio Lui (890 – 905 CE) also mentions Chan-pi to send a trade mission to China. Earlier from a Tang Chinese monk, Yijing, wrote that he visited the Buddhist education center in 671 CE for six months to learn Sanskrit grammar and Malay language. In the year 687 CE, he stopped in again on his way back to Tang China and stayed there for two years to translate original Sanskrit Buddhist scriptures into Chinese. He describes that the place was a center of Buddhism where foreign scholars gathered. Figure 3 – Places in the region of eastern coast. Inset is the plot of places given by Ptolemy with his coordinate system. Numbers are related to the explanations in the text. The piracy prone regions consist of place names, rivers (fluvius), a social body (civitas) and a trading place (emporium). It appears that these places are located along the Batanghari River which prone to piracy. The plot of their coordinates given by Ptolemy are shown on Figure 4. According to Ptolemy, Marinus had quoted the sailor Alexander as journeying from the Golden Chersonese (Tanjungemas), ran from west to east, for a period of twenty days, until a port called Zabæ was reached. From this point, he declared, ships sailed southeastward for a still longer period until the town of Cattigara (unidentified place) was reached. Ptolemy mentions that its maximum hours of the day is more than 12¼ or about 1º in latitude. Apparently, Zabæ is the present-day Muarasabak (from muara, “estuary”, and Sabak), a delta at the estuary of Batanghari River, supposedly a busy trading port in the ancient time. Its latitude is about 1º south of equator. So many archaeological artifacts were found in Muara Sabak, such as ancient boats, settlements, golden figurines and tombs, also potteries, ceramics, beads and pebbles thought to date from the Song Dynasty (11th to 13th centuries CE). The Arab chronicle by Abu Zaid Hassan (916 CE) mentions the place as Zabag or Zabaj where there was an emperor of Sribuza (Srivijaya) there. Other Arab explorers and chronicles also mention it: Mas’udi (10th century), Ibn Serapion (ca 950 CE), Aja’ib al-Hind (ca 1000 CE), Mukhtasar al-Aja’ib (ca 1000 CE), Al-Biruni’s India (early 11th century), Marwasi (ca 1120 CE) and Al-Idrisi (mid-12th century). Several 16th to 17th century maps mention it as Saban or Sabi. Kotokandis is a village on the bank of the junction of Batanghari River and its delta. There are ruins of Buddhist temples and finding of a Hindu bronze figurine of Dipalaksmi here and the adjacent Simpang village. There are also ancient tomb sites believed by the local people as the tombs of Orang Kayo Hitam, Putri Mayang Mangurai and Orang Kayo Pingai, the founders of the Jambi Sultanate. Suakkandis, previously known as Muarakumpeh, is a village on the bank of the junction of Batanghari River and its tributary, the Kumpeh river. Suakkandis was supposedly an ancient trading port where at present the majority of the population are fishermen. The Dutch used it as a trading post to control logistics to Muarasabak in the era of colonialism. There is a place on the bank of Batanghari River near the city of Jambi named Muarojambi, meaning the estuary of Jambi Stream. A small stream is there named Sungai Jambi Kecil, meaning “Lesser Jambi Stream”. Muarojambi is renown for the large Buddhist temple complex, supposedly used as the Buddhism learning center mentioned in ancient texts. Lubukrusa is a small village on the bank of Batanghari River westward of Jambi city. There is a tributary named Danaubangko River across this village so that it was prone to piracy. Muaratembesi is a district on the bank of the junction of Batanghari and Tembesi Rivers so that it was prone to piracy. Muaratembesi is supposedly the center of the 6th to 7th centuries Malayu Kingdom (Earlier Kingdom of Malay). There is a ruin of a fort built by the Dutch here. Figure 4 – Places in the region of piracy prone. Inset is the plot of places given by Ptolemy with his coordinate system. Numbers are related to the explanations in the text. Greek knowledge of lands further to their east improved after the conquests of Alexander the Great, but specific references to places in Southeast Asia did not appear until after the rise of the Roman Empire. Greek geographer Eratosthenes (ca 276 – 195/194 BCE) and Roman geographer Pomponius Mela (43 CE ) had written about Chryse Insula (“Land of Gold”). Roman philosopher Pliny (23 – 79 CE) in Natural History referred to Chryse as both a promontory and an island. The Periplus of the Erythraean Sea (between the 1st and 3rd centuries CE) refers to an island of Chryse, located furthest extremity towards the east of the inhabited world and lying under the rising sun itself. Dionysius Periegetes (about the end of the 3rd century) mentioned that the island of Chryse was situated at the very rising of the sun. Avienus (4th century CE) referred to the Insula Aurea (“Golden Island”) located where the Scythian seas give rise to the dawn. The island of Chryse or Aurea argued by some in modern times as meaning Sumatera and equate it with Suvarnabhumi (“Land of Gold”) and Suvarnadvipa (“Island of Gold”), while including or excluding the Malay Peninsula. Many ancient sources such as the Mahavamsa (between 543 BCE and 304 CE), some stories of the Jataka tales (around the 4th century BCE) and Milinda Panha (between 100 BCE and 200 CE) mention Suvarnabhumi. An inscription found at Padangroco (1286 CE), states that an image of Buddha Amoghapasa Lokeshvara was brought to Dharmasraya (Letter Kingdom of Malay) on the upper Batanghari River, transported from Bhumijava (Java) to Suvarnabhumi (Sumatera), and erected by order of the Javanese ruler Kertanegara. The inscription clearly identifies Suvarnabhumi as Tanjungemas, or Aurea Chersonesus by Ptolemy, which is located in Sumatera. A Majapahit chronicle Nagarakretagama (1336 CE) mentions Suvarnabhumi to refer Sumatera. An Indian text Samaraiccakaha (8th century CE) describes a sea voyage to Suvarnadvipa. These pointing out to the direction of western part of insular Southeast Asia. Buddhist Bengali religious leader and master Atisha, Indian Brahmin Buddhist scholar and a professor of Nalanda Dharmapala, and the South Indian Buddhist Vajrabodhi had visited Suvarnadvipa which refer to the Buddhist learning center in Sumatera. An influential Indian Buddhist philosopher Dharmakirti who worked at Nalanda, a Srivijayan prince of the Sailendra dynasty, born around the turn of the 7th century in Suvarnadvipa. All of these clearly identify Suvarnadvipa as Sumatera. A passage may be cited from Josephus in his Antiquity of the Jews (93/94 CE) in speaking of the pilots furnished to Solomon by Hiram of Tyre. Solomon gave his command that they should go along with his stewards to the land that previously called Ophir, but then the Aurea Chersonesus, to fetch gold. From this he makes a definite statement, that Ophir and the Aurea Chersonesus are one. The 16th to 17th century maps mention Mount Ophir, which is the present-day Mount Talamau, located about 100 kilometers (62 miles) northwest of Tanjungemas. These are other evidence that the Aurea Chersonesus and Ophir are Tanjungemas. While textual evidence may be ambiguous, there are plenty of physical evidence to indicate that Sumatera was the site of a flourishing gold mining industry in pre-historic times. When New Age European explorers and traders came to the island, they found widespread abandoned alluvial and underground gold workings. The extensiveness of some of these workings suggests the presence of a very large, organized workforce. Some of the larger sites include Lebongdonok in Bengkulu, where large grinding stones and classical gold coins have been found, underground excavations in palaeo-alluvials covered by volcanic deposits in Jambi, and Salido in West Sumatera. There is also archaeological evidence indicating that gold was melted and worked at Kotacina, which was a major trading center between the 12th and 14th centuries, located 6 kilometers (3.7 miles) southwest of Belawan in northeast Sumatera. Srivijaya Empire’s wealth and fame were mainly due to the reserves of gold found within its kingdom. 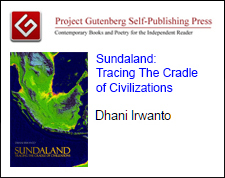 In the 14th century, a senior minister of Majapahit Empire Adityawarman founded the Malayapura Kingdom centered near Tanjungemas and presided over the central Sumatera region, most likely to control the local gold trade. 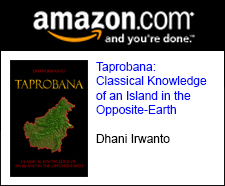 In conclusion, it can be assumed that Aurea Chersonesus, Chryse Insula, Aurea Insula, Suvarnabhumi, Suvarnadvipa and Ophir refer to the same island, that is Sumatera, and specifically Tanjungemas is the most renowned in pre-historic times. Copyright © Dhani Irwanto, 2017. All rights reserved.